Home » Opinion » Analysis: What will Con Lucey do for the IFA? Analysis: What will Con Lucey do for the IFA? Tim O'Leary, Bryan Barry and Con Lucey. The former Chief Economist of the IFA Con Lucey is being brought back on board to help review current issues in the association. 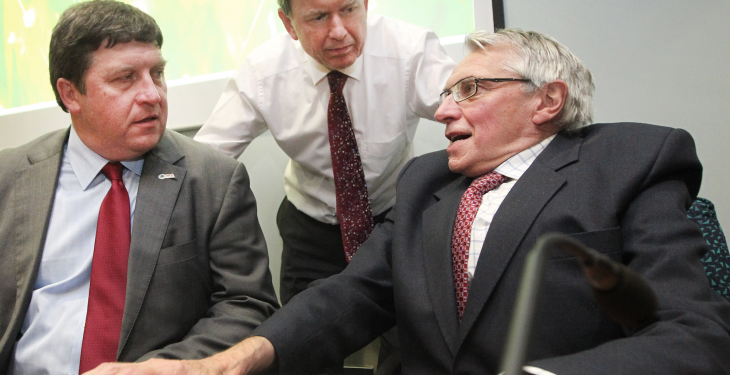 Lucey held the post as Chief Economist with the IFA for 29 years before he retired in 2009. He was lauded as one of the most solid men in the organisation during that time. Lucey was asked, and accepted, to return to the IFA in 2013 as part of an audit committee. However, he stepped away from this audit committee in September 2014 citing concerns over the independence of the committee. At the time, his resignation provoked a lot of unease in the IFA, as Lucey garnered considerable respect within the Association and outside it. 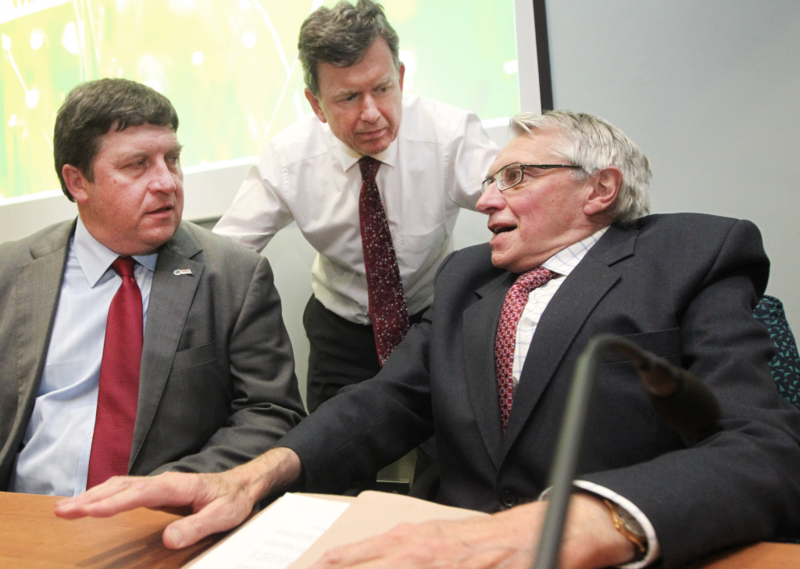 This week, the IFA announced that its President Eddie Downey was stepping aside and that Con Lucey would come back on board to review and report to the Executive Council on a number of issues. Lucey is to look at the implementation of the recommendations around remuneration and other observations in his letters and to make any additional recommendations on corporate governance or other areas which he considers relevant. According to the IFA, Lucey has agreed to undertake this work and will have a report within weeks. It is expected that Lucey will report to the Executive Council, which is due to meet on December 15. IFA President Eddie Downey said that he wished to give Con Lucey and the Association the time and space to thoroughly review the situation and therefore, would step back to facilitate the review. According to O’Leary, Con Lucey will carry out a comprehensive review to address any inadequacies in IFA structures, and will come back to Executive Council with recommendations. It is also hoped by IFA insiders that Lucey will look at the role of the General Secretary and its remit. One source told Agriland that it was of upmost importance that IFA addresses the role of the General Secretary. However, while it is understood that Lucey will not be involved in determining the actual remuneration of senior members of the IFA, one of his main issues was the improvement of financial oversight in the Association. The move by the IFA to bring Lucey back into the fold is seen by most as sensible and progressive, as the issues Lucey raised when leaving in his letters to Eddie Downey can and should now be addressed. In addition, the four men who supported a motion of no confidence in Pat Smith in January of this year could now be instrumental to the success of Lucey’s review. At the meeting, motion of dissatisfaction in the General Secretary was put forward by Derek Deane (Carlow), Pat Hennessy (Laois), Pat Farrell (Kildare) and Tim Cullinan (North Tipperary), but they were gazumped by IFA President Eddie Downey who himself submitted a motion of confidence in Pat Smith – with Downey’s motion voted on first and a public show of hands required. On the day, Downey’s move garnered support from the majority of the Council. In the cold light of day some 10 months later the attempts made by those four men the should be seen as a genuine effort to change the Association’s issues from within. Now the four must row in behind Lucey to help ensure his review process is thorough and complete. The IFA won’t get a second chance to reform, so this time it must put its trust in those who have stood up and asked to be counted.